so yesterday i spent the day at Number7's house with him helping me weld up my rack..
i started with a Rola rack and extension. it's a very inexpensive rack, yet pretty tough. I already had someone weld the extension in permanently quite a while ago (with them just screwed in, it flexed too much for my liking). once welded solid though, it made a extremely stout and great looking rack. the only problem at that point was that the factory crossbars and rail system has tons of movement in it and never felt very secure to me. also, the Rola attachments to the factory crossbars were kind of wimpy and would allow the rack to slide from side to side sometimes when off-camber and fully loaded with tire/fuel cans/etc. the first step was to remove all the factory stuff. next i laid down some 1/8 thick by about 1" wide steel in place of the factory rails, drilled it for the factory attachment holes, rounded off the end corners and got some new stainless steel screws and washers to fasten it to the factory thread-serts. i used only 1/8 thick so it would lay down nice and match the curve of the roof without putting lots of stress on the thread-serts. these pieces really will just need to spread the load of the rack more than any other structural purpose. i still need to fab up a hi-lift carrier on one side and a shovel & axe carrier on the other side, and maybe add some light tabs, etc. and then prep and paint. thanks tons to George for all the help constructing this! I’ve been following your jeep for years and absolutely fell in love with it and everything you’ve done it’s incredible and it inspired me to build one of my own. Now I know that isn’t been a while sense that last time you posted anything and literally just found out you sold he old girl (heartbreaking). 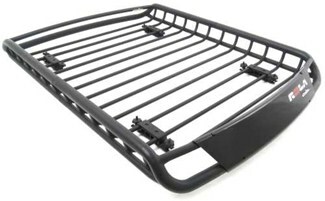 I was wondering if you could help me out with a few things, the design of the roof rack do you happen to have the specs on it? I’ve looked for a very long time and not finding anything that looks as good as yours. Where did you find the pole hangover that was off the back of the jeep? Do you have any specs on the cargo area table? hey there! sorry, i didn't do any blueprints or even write down any measurements on the roof rack or rear table projects. i've seen several people replicate the roof rack idea... . bradywgn on here has a similar one with a different basket. you just basically attach a couple steel strips to the factory nutserts (adding a few inserts if you are so inclined), set the basket up there with some spacers (2x4 or whatever), get it level with the Jeep for looks, measure for your "legs" and then get out the grinder make the legs while test fitting and grinding a little more till they fit perfectly - and finally of course, weld! the rear table used Accuride lock in/out slides, i think they were the 18" version. the only thing i remember that might help you was that when i screwed it down to the floor, the carpet/padding compressed way more than i expected and my tire just barely fit... so if you are making a similar thing to store a tire or containers underneath, be sure to allow some extra height. i did see someone on jeepforum.com once replicated that rear shelf/table design but made out square steel tubing (welded together) and then i think they used an aluminum sheet for the top. sorry i don't know the URL, but ask/search over on JF in the WJ section. Sweet thanks for the response I’ll give it a go and try to figure something out, if I have more questions on things you’ve done do you mind if I ask? I’ve just quickly glanced over the main thing so far. Also how on earth do I get photos put up on here? I’d like to show you mine and what I’ve done. Nice rig, theksmith! Any plan on adding aux lights on your roof rack? theksmith sold this Jeep many moons ago. I was just looking for a Cinders picture when I ran across this old one of Lafawnduh. Remember this? i do - that seemed so steep at the time! i wonder what Lafawnduh is doing right now? That was a good looking rig! After the two weeks it took me to get through all the posts, I guess I am a little disappointed that she got sold. You had a good run with her though. Seemed like one thing after another was getting you there towards the end. I can understand the need to get out while the getting is good. I picked up an '04 Special Edition earlier this year that I am rehabbing. Old engine is out, new-to-me used, hopefully gently, engine is ready to go in. I am already dreaming of the many mods that I plan on implementing from these fine examples that you have provided the masses! I am grateful that you took the time to share. I will keep an eye out for Lawfawnduh if she did in fact make it to Michigan! glad to hear that the build thread is still helping others.... drain their wallet!